Will a new location of the popular specialty store open on Pier 44? California Department of Alcoholic Beverage Control says store seeks a liquor license. Update 10/3: Nicole Moordian, Public Information Officer for L.A. Beaches and Harbor Department, responded after this article had gone to press. Her feedback is included in this article. MARINA DEL REY — Since 2015, talk of the chain grocery store, which features signature shopping products from all corners of the world and healthy eating options for a reasonable price, has been on the books. The Argonaut, in a Sept. 12 report, stated Trader Joe’s was seeking a liquor license for its planned location in Marina del Rey. Trader Joe’s submitted plans to build a new waterfront store in the L.A. County enclave of Marina del Rey, with its services available to the areas boaters. In the lofty redevelopment plans for Pier 44, also known as Admiralty Way, there have been plans to include a Trader Joe’s that would be especially serviceable to boaters. A rendering, dating back to 2015, illustrated a Trader Joe’s directly near the waterfront. Outdoor dining could be seen and boat slips for a “dock-and-shop” concept were also discussed. Featured as well was a water taxi service. In The Argonaut’s article, John Carr, a spokesman for the California Department of Alcoholic Beverage Control, did confirm that Trader Joe’s was seeking a liquor license specifically for a Marina del Rey location. 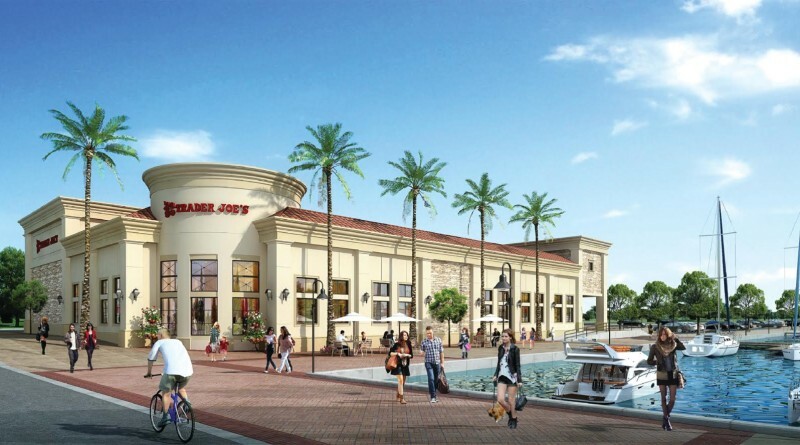 However, though a Trader Joe’s might be popping up in the area soon, at this time it’s unknown whether it will feature the amenities suggested in the renderings from 2015. Another release, authored by Kendra Strey of Marina del Rey and Visitors Bureau, included a section on the future developments of Marina del Rey. The Log reached out to the L.A. Beaches and Harbor Department and Nicole Mooradian, Public Information Officer, stated that only the developer, Armbruster Goldsmith & Delvac, LLP., or Trader Joe’s could confirm. However, Mooradian also told The Log that Marina del Rey Design Control Board had previously approved signage at a meeting that took place on July 18. The Women’s Sailing Association of Santa Monica Bay will be hosting a representative from L.A. County Department of Beaches and Harbors on Oct. 9. Among the subjects of conversation are recent, ongoing and future developments in Marina del Rey. Perhaps, this meeting will shine some light on whether a new Trader Joe’s is moving into the neighborhood? In the coming weeks, more insight as to the retailers included in the newly revamped Pier 44 may become clearer.